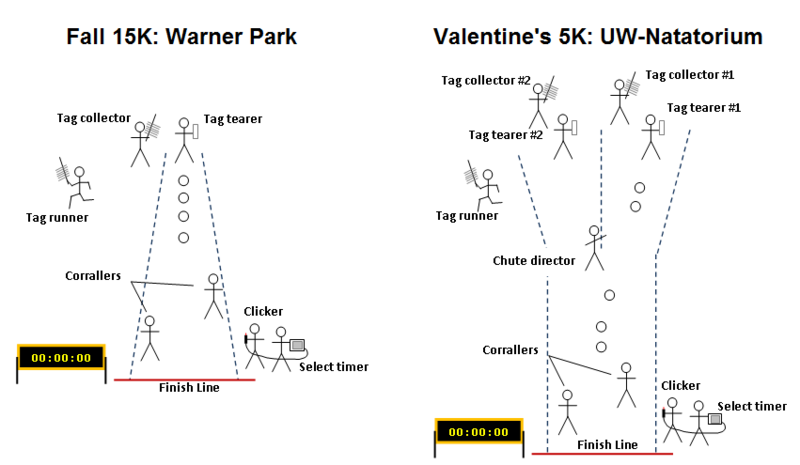 The Running Club hosts two races each year: the Fall 15K (our charity run) and the Valentine’s run (our club fundraiser). These two races are a lot of fun for many people in the community. Club members do not run in the race – even though we want to! Instead, we are required to help behind the scenes. There are many positions available, including some before the race if you can’t make it on race day. Below are instructions to help prepare for your volunteer positions. The Food and Prizes committee is in charge of collecting donations from local businesses. Businesses who donate will have their names displayed at the race as a thank you for their donation. Committee members will be given race flyers and an official letter explaining the race. Pre-reg checklist tables will have the alphabetical lists of pre-registered runners. They will check for their bib number and go to the appropriate pre-registration line. Pre-registration volunteers should hand the runners their bib (ask them to wear it visible in the front) and goodie bag. Relays/teams should be reminded to check the posted instructions. Bikers: one to lead the runners and one to bring up the rear and notify course marshalls when then can leave their positions. The Fall 15K may need a second lead biker for the faster relay teams.